One hand holds the nozzle and controls the flow rate with the fingertips, and the other hand manages the jet pattern and will withstand the recoil force if necessary. Instant response for perfect water control. Slim body for Compact models allowing up to 400 l/min @ 6bar. Protection of the hand and the trigger by a large sized removable bridge and automatic closing of the nozzle in case of a fall during its use. Revolution in the firefighting area: TRIGGERFLOW Compact automatic nozzle with trigger is ideal for Pulsing. Its design makes it safer, more intuitive and more ergonomic. 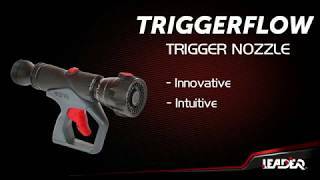 Discover TRIGGERFLOW nozzle with trigger for one-handed flow rate control. The ideal nozzle for Pulsing!